Born in Siberia in 1971, Vadim Repin was eleven when he won the gold medal in all age categories in the Wienawski Competition and gave his recital debuts in Moscow and St Petersburg. At 14 he made his debuts in Tokyo, Munich, Berlin, Helsinki; a year later in Carnegie Hall. At 17 he was the youngest ever winner of the Reine Elisabeth Concours. Since then he has performed with all the world’s greatest orchestras and conductors. Among the highlights of his career in the past few seasons have been tours with the London Symphony Orchestra and Valery Gergiev, the NHK Orchestra and Dutoit; a tour of Australia with the London Philharmonic Orchestra and Vladimir Jurowski, and acclaimed premières in London, Philadelphia, New York’s Carnegie Hall, the Salle Pleyel in Paris and Amsterdam's Concertgebouw of the violin concerto written for him by James MacMillan, culminating in a BBC Prom at the sold out Royal Albert Hall. Vadim Repin recorded the great Russian violin concerti by Shostakovich, Prokofiev and Tchaikovsky on Warner Classics. For Deutsche Grammophon he recorded the Beethoven Violin Concerto, the Brahms Violin Concerto and Double Concerto (Truls Mørk, cello) with the Gewandhaus Orchester, the Tchaikovsky and Rachmaninov trios with Mischa Maisky and Lang Lang (which won the Echo Classic) and works by Grieg, Janacek and César Franck with Nikolai Lugansky, which won the 2011 BBC Music Award. In 2010 he received the Victoire d’Honneur, France’s most prestigious musical award for a lifetime’s dedication to music, and became Chevalier de l’Ordre des Arts et Lettres. Following master classes and concerts in Beijing in December 2014 he was awarded an honorary professorship of the Central Conservatory of Music, and in 2015 an honorary professorship of the Shanghai Conservatory. Highlights of the last season included concerts in Hong Kong and Beijing, a European tour with Orchestre de la Suisse Romande under Neeme Jarvi, and concerts in Vienna with Kent Nagano and Lionel Bringuier. In April 2014 Vadim Repin as Artistic Director presented the first Trans-Siberian Festival of the Arts in Novosibirsk's magnificent new concert hall, featuring a new commission, 'Voices of Violin' by Benjamin Yussupov, and a joint appearance by Vadim Repin and prima ballerina Svetlana Zakharova. The Festival was enthusiastically received and was repeated and extended in the spring of 2015, this time featuring a specially commissioned violin concerto, ‘De Profundis’, by Lera Auerbach. Last season began with concerts in Vilnius, Prague, Vienna, Paris and Ankara and a Vadim Repin Festival in Tokyo in November with chamber music and orchestral concerts. Performances in the United States were followed by concerts with the Philharmonia Orchestra and Vladimir Ashkenazy in London and Cardiff, the German première of the Yussupov concerto in the Berlin Philharmonie, and a return to Japan for concerts with the Tchaikovsky Symphony Orchestra to celebrate the Tchaikovsky centenary. This season began with concerts in Yerevan, Barcelona and Madrid and a tour of European capitals with the Tokyo Metropolitan Orchestra, and will culminate with a ‘Transsiberia goes to Tel Aviv’ project. Vadim Repin plays on the 1733 'Rode' violin by Stradivari. Yang Yang, born in a musical family, learned piano with Prof. Li Qifang. Later, he learned conducting respectively with Prof. Xu Xin and Prof. Wu Lingfen, and then was admitted to the Conducting Department of Central Conservatory of Music, being one of the students of Prof. Yu Feng. In November 2006, Yang won the first place for his outstanding performance at the Dimitris Mitropoulos International Competition for Orchestral Conducting in Greece. It’s the first time for the Chinese conductors to have such honor. As one of the most active young conductors in China, Yang has maintained close partnership with all mainstream orchestras and opera houses domestically. Meanwhile, he has successfully left tracks at a host of foreign orchestras such as Deutsches Symphonie-Orchester Berlin, German Philharmonic Orchestra of Cologne, Stuttgarter Philharmoniker, National Rhine Philharmonic Orchestra, New Brandenburg Philharmonic Orchestra, Italian Verona Opera House, Teatro Regio Torino, Italian Rome Philharmonic Orchestra, French Cannes Symphony Orchestra, Bordeaux Symphony Orchestra, Valencia Orchestra of Spain, Greek Symphony Orchestra, Athenian Chamber Orchestra and Korean Incheon Philharmonic, etc. He had sincere cooperation with world famous musicians such as cellists Lynn Harrell, Alban Gerhard, Wang Jian, Natalia Gutman, violinist Maxim Vengerov, Gidon Kremer, Midori, Sarah Chang, Augustin Dumay, Lenard Karpison, Cho-Liang Lin, pianists Gary Graffman, Lang Lang, Barry Douglas, Jean-Yves Thibaudet, Kun-Woo Paik, Jon Kimura Parker, soprano Sumi Jo, clarinetists Sabine Meyer, Wenzel Fuchs, French horn players Radovan Vlatkovic, Stefan Dohr, etc. Yang had also cooperated with all Chinese distinguished musicians. Recommended by maestro Yu Long, Yang started his conducting career in the year of 1998, at the First Beijing International Music Festival (BMF). Since then, he conducted operas and concerts at BMF eight years consecutively. From 2000 to 2016, Yang Yang held the position as the Assistant Conductor and Resident Conductor of the China Philharmonic Orchestra (CPO). In 2006, Yang Yang attended an advanced training course hosted by maestro Myung-whun Chung in Korea. In 2009, he has presided over the founding of Hangzhou Philharmonic Orchestra (HPO). Since 2009, Yang Yang and HPO had successfully completed ten music seasons, and performed at leading festivals including Mecklenburg-Vorpommern Festival, Schleswig-Holstein Musik Festival, Ravello Festival, Emilia Romagna Festival, Taormina Festival, Ljubljana Festival. He also toured with HPO extensively in Russia and Estonia. In 2018, Yang toured with HPO to Greece, Bulgaria, Romania, Serbia and Hungary, the Belt and Road countries, winning great applause and high critical acclaim at home and abroad. 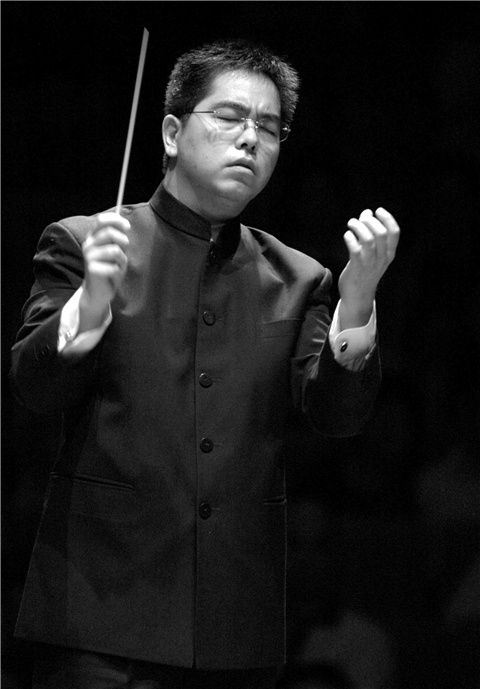 From his conducting career to 2016, when he was appointed as Music Director and Chief Conductor of China National Opera House, Yang had conducted China Philharmonic Orchestra, China National Opera House and Hangzhou Philharmonic Orchestra and successfully demonstrated many of the great operas, such as Le Nozze di Figaro, Die Zauberflöte, La Traviata, Rigoletto, Turandot, Madama Butterfly, La Bohème, Cavalleria Rusticana, Pagliacci, Carmen, as well as many Chinese opera’s debut in China including Night Banquet, Wolf Cub Village, Songs Of The Long March, The Red Detachment of Women and Manas. Yang toured with China National Opera House to Swiss and Italy for Giacomo Puccini Opera Festival with Turandot, Madama Butterfly and Songs Of The Long March successfully, which drew broad attention internationally and showed his outstanding talents in opera conducting. Yang Yang is now acting as Music Director and Chief Conductor of China National Opera House, Artistic Director and Chief Conductor of Hangzhou Philharmonic Orchestra. Former Assistant Conductor and Resident Conductor of the China Philharmonic Orchestra, Yang Yang has collaborated with the orchestra countless times.